State of the art of rotational moulding. Provides for high productivity, maximum flexibility and energy efficiency. Configurations can be increased from 1 to 4 carriages. In line with client's diverse needs, we bring forth a distinguished collection of Four Arm Biaxial Machine. We are offering Independent Arm Water Tank Making Machine to our clients. - OVEN CHAMBER: Oven panel has been from Insulated from 1.5 mm thick CRCA sheet, sandwiched type by using car wool and wire mesh. - Oven doors operated electrically through Geared motor and rack and pinion drive. - Imported Italian make reliable Auto Ignition type Burner suitable for Gas/ Kerosene/ diesel. You can customise your three arm machine to suit the demand from the market. L Arm / Offset Arm holds single mould of large tank, where as Straight Arm has innovative design to give you choice of mounting either two or four moulds at a time. This helps in reducing production cost of small tanks. The TMA Turret Machines are sturdy and efficient rotomoulding machines has been introduced by The Mould Art to meet the needs of today’s rotomoulders for efficient and economical operation. 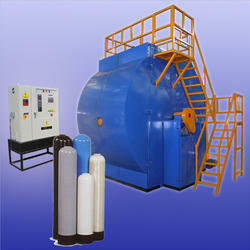 - A Moving Chamber heated by LPG, Diesel or Dual Fuel Burner.